I used Mountain House Pro-Pak freeze dried meals that I bought with me from the States (purchased from REI). This was the first time that I had eaten freeze dried meals and they were delicious. You simply boil some water and pour it into the package and wait a few minutes until it absorbs. A delicious meal with no pot to wash! For deserts I bought canned pineapple and fruit cocktails. I made sure that all the lids were pop-tops in case I could not get the can opener to work. I bought these items because I was very concerned about dehydration so wanted to get fluid wherever I could. I would not bring canned fruit along if I were do it again because of the weight. I also bought some Ramen packs since they are very light for just in case extras. Did not use them. Snacks – bought a bunch of dried fruit packets. These were very nice, I could easily eat them while I was kayaking. I also bought some jars of peanut butter and crackers. The problem with the crackers is packing them. They did not fit into my food pod. I put them in my dry bag but they got squished. Drinks – instant coffee, water, and also Crystal Light drink mixes that I dropped into the big water bottles. Other items – I bought marshmallows but could not get a good enough fire going to do a real marshmallow roast. Hot chocolate – I bought some instant packets along thinking that I might enjoy some after a hard day of paddling or if I got caught in a storm. I may have used one. Breakfast – I used two packets of instant oatmeal for each breakfast. I bought those with me from the States. They are probably available in Koror. Water - I was very concerned about not having enough. When I was in Tikehau, French Polynesia I drank 6 liters of water a day (none for cooking, just drinking). I ended up with way too much water and my kayak was very heavy. I'm told that a heavier kayak is more likely to tip. 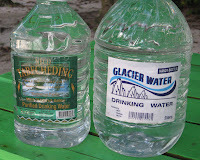 The large water bottles found in Palau come in gallon (3.79 liter) and 5 liter sizes. Normally people allow one gallon per day. It turned out that it indeed was what I did use for all purposes. However, I tried to go with 10 of the 5 liters for what was scheduled to be an 8 night, 9 day trip. I could not find enough large bottles in the small stores in Malakal and had to go with some of the smaller bottles. The plan was to fit all the water that I could into the kayak, take two extra bottles with me to my starting point at Ulong (which I would drink while there) and have the rest delivered to me at my shuttle on day 7.